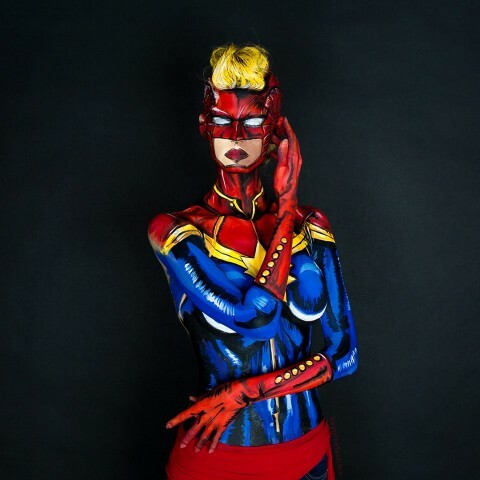 Captain Marvel Body Paint « Adafruit Industries – Makers, hackers, artists, designers and engineers! We recently featured Kay Pike’s impressive and scary Attack on Titan body paint, and she’s been keeping busy since then with other applications — less creepy ones, thankfully. Her friend De looks like Carol Danvers, a.k.a. Captain Marvel, so Pike decided to create what looks like a full body paint job depicting the character. She did a great job of making the paint look like fabric. She said she’s still learning the techniques — especially how to make spandex glow just right on the highlights — but I think she’s doing a great job. You can get a better look at the costume in this Instagram video.